Mindfulness experts, Rasmus Hougaard and Jacqueline Carter join your GutwiZdom hosts, Deidre and JG to talk about their new book, “The Mind of The Leader” and the 3 essential qualities you need to be an inspiring great leader! With billions of dollars spent on leadership development and training, why do employees still find their leaders so un-inspiring? 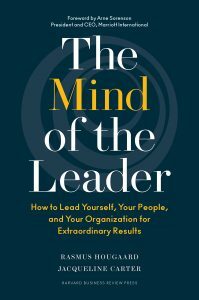 Rasmus Hougaard and Jacqueline Carter – authors of “The Mind of the Leader” interviewed over 35,000 leaders and determined that by understanding how our own minds work, only then can we really be better at leading others. Their company, Potential Project, is recognized as a leading International authority on training the mind to be more focused, effective and clear. Put people at the center of your strategy. If we take care of our people, they will take care of our customers! Learn about yourself first. If we don’t understand ourselves as leaders, we won’t be able to lead others. Self-awareness is the first step on the ladder to being a great leader. There is a direct relationship between focus and effectiveness. It’s okay to let your mind wander, in fact, it’s normal! BUT, we can train our brains to overcome it and be more effective. If you’re not engaged with your people when you’re with them, they will know, and their engagement will go down. Use mindfulness to improve focus. Being more mindful is a way to manage our minds better. Choose when to be creative and be aware of your ideas, but also choose when to be strategic and focus on the ideas that are most important. The 3 foundational qualities all leaders need today. Mindfulness: The ability to be focused and to have self-awareness. You will be lost without them! Selflessness: Leading others is about others. It means taking the blame, giving the stage to the people you’re leading, and putting others first. Compassion: The ability to want to see others to be successful. People want to know their leaders have their back and then there will be more engagement! LISTENERS: Do you need help with style? Share your experiences and “wiZdoms” with us! Either leave us a voicemail at 1-646-653-9278 or send us an email. We may talk about it - or we may even talk with YOU - on the air!